A Time For Choosing: Iran Placing Medium-Range Missiles In Venezuela That Can Reach The U.S.
Iran Placing Medium-Range Missiles In Venezuela That Can Reach The U.S.
At a moment when NATO members found an agreement, in the recent Lisbon summit (19-20 November 2010), to develop a Missile Defense capability to protect NATO's populations and territories in Europe against ballistic missile attacks from the East (namely, Iran), Iran's counter-move consists in establishing a strategic base in the South American continent - in the United State’s soft underbelly. Venezuela has also become the country through which Iran intends to bypass UN sanctions. Following a new round of UN sanctions against the Islamic Republic, for example, Russia decided not to sell five battalions of S-300PMU-1 air defense systems to Iran. These weapons, along with a number of other weapons, were part of a deal, signed in 2007, worth $800 million. Now that these weapons cannot be delivered to Iran, Russia is looking for new customers; according to the Russian press agency Novosti, it found one: Venezuela. The author goes on to say these missiles will be capable of carrying a nuclear payload. Continue reading this shocking report here. Obviously this is very troubling. Hugo Chavez was just given powers by the Venezuelan Parliament to rule by presidential decree for 18 months. In other words, Chavez, a Communist, has been made a dictator. Anyone think he'll surrender that power in 18 months? While the U.S. Might not be in immediate danger, Venezuela's neighbors, many of them our allies most certainly would be. The U.S. Is one of oil rich Venezuela's biggest customers. Meaning we are helping fund the placement of these missiles that could be used to destroy our allies and cause serious destruction here. One more reason we need to become 100% energy independent, but another discussion for another day. The missile story is troublesome, but the fact Chavez [ a really unstable man] has now been made a dictator with absolute power to do anything he wishes, is the real story here. The backstory is different, and the histrionics not so dramatic, but we are possibly seeing history repeat itself. If folks remember March 23, 1933, and the implications of what happened on that date, they will understand the concern. 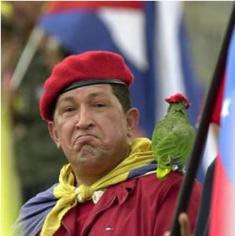 Chavez has already made attempts to destabilize the entire region, and has Communist allies in neighboring countries. With these new weapons, the conquest of our allies would be made much easier. Of course, as we ponder what to do with Iran, we must remember that even though we are Venezuela's biggest customer, when push comes to shove, Chavez will support Iran, and use his missiles as first strike weapons. His nuclear capable missiles. This is as bad or worse than the situation Kennedy faced with the Cuban Missile Crisis. Frankly, it's worse. When the Russians attempted to place nuclear missiles in Cuba, America was in grave danger, but ultimately the threat of the destruction of the Soviet Union by a nuclear strike from the U.S., was a sobering thought. In the end, the Russians wisely backed down. Iran is a different animal. The theocracy is ruled by some who have no fear of dying in service to Islam, or even seeing their entire nation reduced to ashes if that's what it takes. In fact there is a group led by Iran's President Ahmadinejad who believe apocalyptic destruction would be a good thing. In fact, they believe it's desirable, as it would pave the way for the Twelfth Imam's appearance. This is a situation the Obama regime needs to be all over. Sadly we are hearing nothing. Obama is no Jack Kennedy, and the United States is in big trouble. Once these missiles are in place, the time for talk will be over. There will be few options at all.